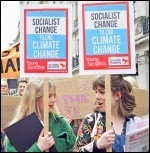 Socialist Party :: Issue 1000 extra 1,000 sales target smashed! 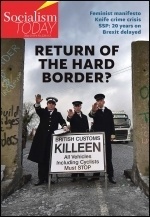 Inspired by reaching the milestone of 1,000 issues of the Socialist, sellers across England and Wales have responded magnificently by smashing through the 1,000 extra sales target for issue 1000. 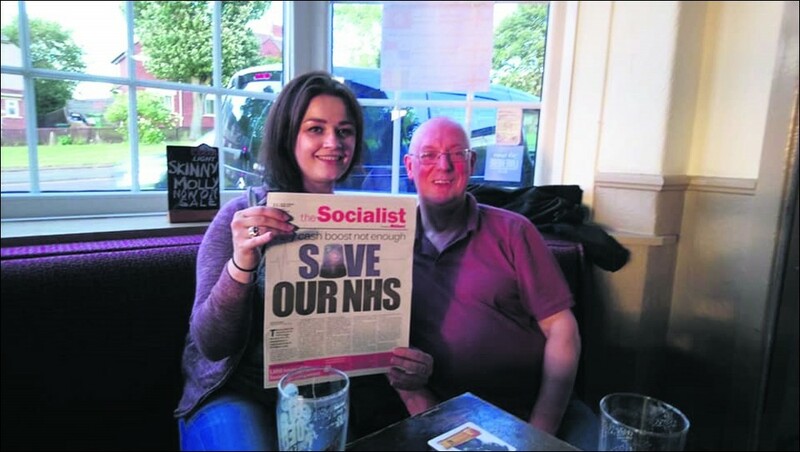 Helped by the beautiful summer weather, as well as the clear socialist policies to defend and improve the NHS, branch after branch of the Socialist Party has seen increased sales helped by new and different activities. Top of the sales chart is Swansea and West Wales branch which sold 245 copies, more than doubling their initial target of 100, with Waltham Forest branch in east London coming second with 154. Southampton branch sold 107 from all their campaign stalls. For several of our members this was their first activity. One member in Cardiff East branch, inspired by their success in selling eleven at their local hospital, now wants to do a weekly stall there. Many areas report that their stalls during this week-long campaign have been some of their best ever, such as the stall at the Monument in Newcastle. Mansfield members sold 38 including ten on the Chatsworth ward at Mansfield community hospital, which was recently saved from closure by a campaign led by Socialist Party members. Our members in Gloucester on their tour of Gloucestershire sold 30 and in West Cheshire our members sold 17 on their campaign stall - an increase on their usual campaign activity. Every sale that our members have carried out has ensured that we got a tremendous response to our 1000th issue. Can your branch continue this excellent work by holding one or two extra stalls every week? Stoke had a brilliant response to the 1000th issue of our paper, starting with four pre-ordered from an estate sale the week before. On 23 June we had a protest against NHS cuts. We had a stall out for three hours which sold 50 copies of the Socialist. We had another stall out on Tuesday and sold another 30. We were determined to sell 100 over the week so we also had stalls on 25 June selling another 17, taking us to 101 in total as well as raising £46.51 for the fighting fund. Swansea and West Wales branch on 21 June planned in detail our 1000th issue campaign with a target of 100 papers, £100 fighting fund and five join cards filled in. Our meeting on 28 June was euphoric at smashing our targets after a week of determined campaigning on the NHS every day by over a dozen members we celebrated with a victory cake decorated with a red flag. We did campaign stalls and station sales in Swansea, Llanelli, Port Talbot and Neath each day as well as a car boot sale. Our final tally was 230 paper sales, £424 fighting fund and four join cards filled in. Phew! During a station paper sale one woman said she'd never read our paper before and was interested to find out what we were about and see what she thought. Just goes to show, first of all, the importance of the paper as a vehicle for our ideas but also of persevering, as comrades have done with issue 1000 sales!